These easy appetizer recipes can add that extra kick to any get-together. The best conversations and laughs happen when everyone is busy nibbling. An amazing thing about easy appetizers is the fusion of flavors from around the globe. You can have a few dips of different (Spanish, Italian, Indian or Mexican) flavors and they will compliment each other well. You will find here many easy and healthy appetizer recipes which don't even have to wait for a party. You can make these to enjoy with your family and friends, over a football or cricket match. It will be so much fun and you will have a huge spread to munch, with minimal effort. Easy Garlic Bread - You can make this easy garlic bread recipe and a tomato bread, serve with some dips and sit back and enjoy the compliments. All you need for this easy appetizer recipe is a french bread and two easy spreads. Grilled Chicken Wings - These yummy grilled chicken wings can have you lick your fingers. They serve as wonderful easy appetizers with or without dip. Making them is so easy. Just mix up everything and place under a grill. Tempura Recipe - Tempura recipe can be made with any ingredients. Here is how you make prawn tempura. You can even make assorted vegetable tempura and serve them with a few dips. No matter what you make, it will be a big hit amongst your guests. Crudites With Dips - If you are looking for a really easy and healthy appetizer recipe, here is one. All you need is a selection of dips and any vegetables that you can eat raw. If you want you can quickly chargrill the vegetables. Here's how. Tomato Salsa Recipe - When you think of easy appetizer recipes, you think of salsa. Here are two salsa recipes for you. The most common tomato salsa and salsa verde recipe. You can use them as a dip, spread them in rolls, fajitas or wraps and even put them in salads. The ways in which you can enjoy a salsa recipe are many, you just have to use your imagination. Pesto Recipe - Pesto recipe is such a quick, flavorsome and easy appetizer recipe. It can be used as a dip or spread. Use it to flavor pasta, spaghetti or sandwiches. Meatball Recipe - Here is a hot and spicy meatball recipe for you. Serve this easy appetizer recipe with a mint chutney or any chutney of your choice. You can make some extra and then use them to make kofta curry. Won't you just like when you can kill two birds with one stone. Sweet Corn Cake - Enjoy these delicious sweet corn cakes with a chili dip. These cakes are shallow fried, hence make an easy appetizer recipe. Finger Food Recipes Are you tired of just throwing a bowl of chips and salsa on the table for your parties? Let Finger Food Recipes help you turn a basic party into an event to remember. In India, the concept of appetizers is very different. 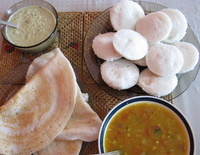 The main meals usually constitute of one or two vegetables dishes, one dish of pulses, rice, chapati, raita, pickle and sometimes papad as well. Along side there is a salad which can be as simple as sliced onions, tomatoes and cucumber with a little salt and lime juice. All this is followed by a dessert, which can be something grand or a small piece of an Indian mithai (Indian sweet). As you can well imagine, with a lavish meal like mentioned above, there is really no room for an appetizer before a meal. Strange enough unlike most European countries in India the food takes a long time to cook but it takes only 15-20 minutes to finish a meal. This of course is a general statement. In olden times it was said that there should be no talking while eating. Many families still practice that. That itself cuts down on the meal time. Of course, things are changing now. These days people do like to take a 3 course meal which might start with a soup or salad, the main course which typically constitutes of at least one vegetable or meat dish and a pulse dish (dal, rajma , chole etc) and ends with a dessert. Meals especially dinners are a time for the whole family to get together and share a conversation about different things. 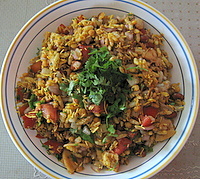 Appetizer recipes in India are more like light or heavy snacks, which can be taken in between meals, with tea or coffee. These snacks can be made in numerous ways by using a lot of ingredients. The healthy ones are poha, pongal, idli, dosa, dhokla etc which consume very little oil. Then there are these heavy snacks which are tasty but naughty like samosa, pakoda, bhel-puri, chaat, cutlets, to name a few. Every state in India has it's own typical snack food. Hence, there are countless snacks. Party, weddings and other social events do call for entrees appetizers that are served with drinks. The most common ones being kebabs, tikkas, bite size cutlets, vadas and many other savory items. Not to mention the countless Indian sweets that are also served as snacks.